The Royal Navy of Morocco has taken delivery of a new 72m vessel, intended to fulfil long-lasting missions, especially hydrographic and oceanographic surveys, at high speeds and in rough seas. Christened Dar Al Beida, the vessel was constructed by French builder Piriou to the specs of the BHO2M class, devised by Kership – a joint venture established between Piriou and Naval Group in 2013. The French Navy Hydrographic and Oceanographic Service (SHOM) also contributed to the “scientific part of the vessel”, Piriou says, including the selection of equipment such as: multibeam and single beam echo sounders; sub-bottom profiler; side scan sonar; magnetometer; expendable bathythermograph; weather station; gravity corer; and data acquisition system, among others. According to Piriou, the entire package was selected to meet the latest International Hydrographic Organization (IHO) standards. Built with a steel hull, the vessel has a 15m beam, a maximum draught of 5m and a range of 5,000nm at 10knots – sufficient to guarantee operational autonomy for up to 30 days, Piriou states. Dar Al Beida is powered by four electric gensets, each rated 1,200kW, and has the capacity to carry up to 50 persons, including crew and scientific personnel. She also carries two hydrographic speedboats and a workboat, enabling personnel to disembark to visit areas with shallow and/or restricted waters. In addition to these science-related activities, the vessel will be used to undertake patrols and missions related to search and rescue, diver deployment, environmental protection and humanitarian assistance. Dar Al Beida is the second vessel that Piriou has built for the Royal Navy of Morocco, the first being the 50m x 11m, 300dwt landing craft tank Sidi Fini, which was delivered in July 2016. 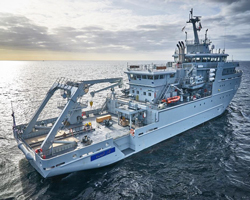 Last year, Piriou’s facility also fulfilled an overhaul contract for the Royal Navy of Morocco's 1995-built, 65m deep-sea patrol vessel Rais Bargach, including complete renewal of that vessel’s hull, superstructure, paintwork and accommodation areas.